Delano dentures are a viable replacement for missing teeth. They are removable in the sense that they may be carefully removed and placed back into the mouth conveniently. Dentures today are made to resemble the natural color of our teeth, as well as to rest comfortably in the mouth. Note that all denture options will not feel exactly the same as natural teeth despite how advanced technology has become, however a large majority of denture wearers find no issues getting used to them over time. What Denture Options Do I Have? Dr. Paul Mallouk offers his patients a couple of different denture options that will be determined based on your specific needs. Also known as complete dentures, full dentures are typically what most people think of when they first hear the word “Dentures” – an entire new set of functional teeth. They are designed for those with no teeth in the mouth. All teeth must be removed in order to support a set of full dentures. This process may take awhile as your gum tissue must be completely healed before dentures are placed. During the process of gum tissue healing, you will be without teeth. This isn’t a viable solution, so you will receive a set of immediate dentures that are placed immediately following the removal of your teeth. This allows you to have a set of teeth to utilize as your mouth heals for proper placement of full dentures. However, immediate dentures must be constantly refitted in order to remain comfortable as bones and gums shrink over time during the healing process. Immediate dentures should only be used a temporary option until full, complete dentures may be placed. 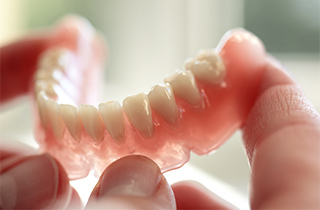 Partial dentures are different from the other two options as they involve the use of a gum-colored plastic base that may be connected by metal framework holding the denture in place. Partial dentures are recommended when one or more natural teeth remain in the upper or lower jaw to support. Have Questions? Contact Your Delano Dentures Dentist Today! 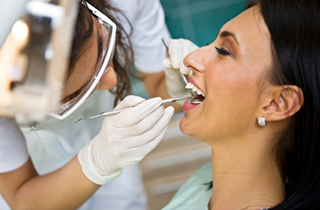 Most dental insurance providers cover some or all of the cost of dentures. Contact your Delano denture dentist, Dr. Paul Mallouk, today @ 661-725-9105 to schedule a consultation where all of your questions may be answered. You may also conveniently fill out our form to the right.